LIMA, Peru (AP) -- When she launched her run for the presidency two years ago, Keiko Fujimori's stated aim was to free her father Alberto, who is imprisoned for killings and corruption during his decade-long rule. Now the congresswoman has a strong chance to become Peru's first female leader and she is trying to establish her independence from her presidential father even as she adopts many of his key advisers and policies as her own. While some Peruvians honor her father for crushing a bloody leftist guerrilla movement, many recall him as the man who led the most corrupt government in their country's modern history. Her chances in the June 5 runoff may depend on which alternative Peruvians fear more: the daughter of a man serving a 25-year sentence for authorizing death squad killings and looting the treasury, or leftist military man Ollanta Humala, whom critics liken to Venezuela's Hugo Chavez. Polls show voters almost evenly spit, though several surveys have put Fujimori slightly ahead. Her biggest challenge has been trying to cope with the shadow of her father's legacy. 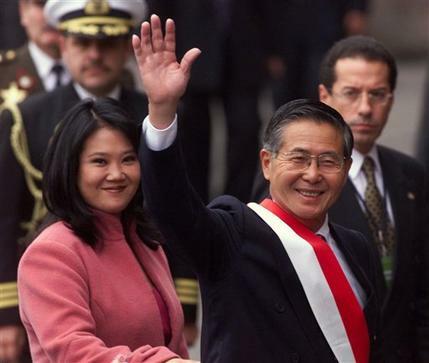 Since Alberto Fujimori fled Peru and faxed his resignation from his ancestral Japan in 2000, about 1,500 people connected to his government have been prosecuted on corruption and other charges. "In the history of South America, at least, nowhere have so many people have been tried for corruption beginning with the president, his ministers and generals," said Pedro Gamarra, an anti-corruption prosecutor handling cases from Fujimori's presidency. Those convicted and sentenced to prison include eight former Cabinet ministers, three former military commanders, an attorney general and a former chief of the Supreme Court, as well as soldiers who belonged to a secret death squad that killed at least 50 people. Two brothers and two sisters of the former president are on a list of 55 government-linked fugitives. Experts believe no other Peruvian government has looted the nation's treasury on the scale of Alberto Fujimori's. Transparency International deemed Fujimori the seventh most corrupt leader in modern times on a list topped by Suharto, the former Indonesian leader. It estimated members of Alberto Fujimori's administration stole $600 million. Estimates by others reach into the billions. About $184 million has been recovered from bank accounts in Switzerland, the United States, Luxembourg and Panama, said Avelino Guillen, the prosecutor who eventually won Fujimori's 2009 conviction. The Peruvians who back Keiko Fujimori are primarily from the middle and upper classes who fear Humala could at least partially dismantle the free market. She is also backed by Peruvians who credit her father with defeating Shining Path rebels and putting the economy on solid footing. She argues she should not be blamed for any crimes committed under her father. "I'm not Alberto Fujimori. Children don't carry the responsibilities of their parents," the 35-year-old congresswoman said in an April radio interview. "I'm a different person." But she has not clearly drawn a line between his policies and hers, and has focused on the same campaign promises that worked for her father: fighting crime, working for the poor and providing school lunches and uniforms. Detractors say her father's fingerprints are all over her campaign and he can be expected to exert substantial influence over a Keiko Fujimori presidency. Photographs recently published by the newspaper La Republica feed such concerns. They show two of Keiko Fujimori's campaign trucks appearing to enter and leave the police compound where Alberto Fujimori lives in relative comfort as the sole inmate. Keiko Fujimori told reporters the trucks had been coming and going from a nearby party office, not the lockup. But that did little to satisfy doubters who recalled that the government acknowledged last year that Alberto Fujimori was receiving as many as 180 visits a day. Keiko Fujimori denies her father is in any way running her campaign. "I always had different opinions from my father," she said when asked by The Associated Press. "I haven't had to wait until this far along in the elections to demonstrate that I'm independent." When her father was convicted two years ago, she insisted she would pardon him if elected president. In recent months she has reversed that stand, swearing publicly she will not pardon him. Yet in the areas where she might have most strongly distanced herself from her father - corruption and human rights - she has largely been silent. She has condemned some of the killings during her father's government but has insisted he was not involved. When she has mentioned her father at campaign stops, she has called him "Peru's best president," and said he was he was unjustly convicted and will ultimately be absolved on appeal. Critics say her campaign also is largely run by people who had worked closely with her father. Her top campaign aide, Jaime Yoshiyama, led the legislative body that rewrote Peru's constitution after Alberto Fujimori shut down congress in 1992. That allowed him to be re-elected twice. Another campaign adviser, Alejandro Aguinaga, was Fujimori's health minister when the government was accused of forcing some 3,000 poor peasant women to be sterilized. Fujimori's allies said the women consented. "Keiko is with the same people as her father. And one thing that's important for her is impunity, not only for her father but also for this whole mafia that ended up governing Peru," said Marly Ansualdo, whose 25-year-old brother was kidnapped and killed by soldiers in 1993. Alberto Fujimori's intelligence chief Vladimiro Montesinos wielded unusually broad powers and his boss's undoing came with the publication of videos showing Montesinos bribing congressmen and business executives. Montesinos is serving a 25-year prison term for crimes ranging from killings to the selling of arms to Colombian rebels. Fujimori biographer Luis Jochamowitz says Montesinos was far more than a member of Fujimori's inner circle. From 1993 to 1996, the president and his children lived with the spy chief at the secret police headquarters, he said. "Montesinos was 'Uncle Vladi' for the children of Fujimori," Jochamowitz said. Critics of Keiko Fujimori say she did not prove herself as a lawmaker after being elected to Congress in 2006, though she had served as first lady after parents' 1994 divorce. She acknowledges 370 absences during her tenure, some for maternity leave as she gave birth to two daughters, some for finishing a master's degree in business administration at Columbia University. She sponsored just six laws in all. Among her supporters, Fujimori projects an image of a hardworking and decisive leader. She also still finds support among some poor Peruvians grateful for her father's social programs. "Her father used to support schools. He carried out some good projects," said Bertila Requejo, a 37-year-old supporter in a Lima slum where the ex-president brought water and electricity to some homes. "It could be that Fujimori made mistakes, but his daughter can make things better." Nobel literature laureate Mario Vargas Llosa, who lost to Fujimori's father in the 1990 presidential vote, has been campaigning vigorously against her election. If she were to win on June 5, he said at a news conference in Uruguay last month, it will mean that "thieves and murderers who have been convicted by civil courts, in impeccable trials, would once again be governing Peru."